Set in the early 20th century, The Ishmael Club - a club of "outsider" writers and artists - tells of the life and death of the friendship between artist Norman Lindsay and political cartoonist and war artist Bill Dyson, who married Lindsay's sister Ruby Lind, also a professional artist. The play would be noteworthy for its character portraits alone, which are extremely well fleshed-out by Brett Climo as Dyson, Robert Menzies as Lindsay, and Asher Keddie as Ruby. 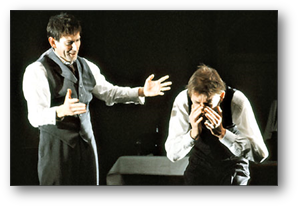 Menzies's fine acting reveals both sides of this character, but he is not the hero of the play. It is the socialist, Dyson (played with sympathy and sincerity by Climo), who recorded the horrors of World War I as an official artist, an experience that deepened his left-wing sense of the plight of ordinary men and women.